From central Maidstone, follow A229 towards Hastings. 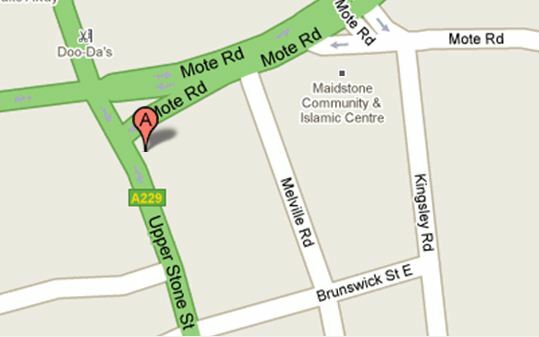 Follow the one way system past Maidstone Police Station and continue up Lower Stone Street. At the main traffic lights continue straight ahead up Upper Stone Street. You will find we are the first store on the left hand side. As car parking is at the rear of the building, take the 1st turning on your left after the store into Brunswick Street East. Take your next turning on the left and enter Melville Road. At the end of the road you will reach a main road which is Mote Road. Turn Left, keeping into your left hand lane and after terraced houses take a small turning on the left, just before a raised private car park, which will lead you behind our store where there is parking outside our back door entrance.